The first collection of 52 works especially well as a trade paperback. In part because the weekly book offered only twenty pages instead of the standard twenty-two, the writers pack each chapter full of short scenes with plenty of information--sometimes, multiple plotlines are forwarded in separate panels on the same page. This makes an already sizable trade paperback feel even longer. Though the authors knew they had fifty-two weeks with which to tell their story, there's no sense of decompression here, nor does any issue seem rushed. The pacing of the book only becomes uncomfortable, actually, in the rare points when it seems the authors tried to write against the book's type--an extended fight scene between Steel and his niece, for instance. Even here, however, the change in pacing functions to give the scene emotional resonance. In using chracters with similar emotional conflicts, the writers give the disparate plotlines a cohesive feel. Renee Montoya has turned self destructive in the aftermath of her partner's death and her failure to take revenge, and the story opens with Ralph Dibney suicidal over the death of his wife, while Black Adam turns his anger over his family's death outward against the nations of the world. Steel struggles to be a true hero in a more dangerous world, while Booster practices heroics for his own personal gain. Booster's materialism, however, may hide true altruism, while Lex Luthor's professed altruism is certainly a cover for something darker. At the end of the book, Montoya leaves for Kahndaq, undoubtedly to meet Black Adam; I imagine the emotional similarities will generate interesting dynamics when all the characters, Seven Soldiers style, finally meet. 52 offers a very representative slice of what life is like on DC's post-Infinite Crisis "New Earth." The final issue offers a team-up of Green Lantern, Green Arrow, Metamorpho, and Zauriel, coming together to help out Elongated Man; earlier in the story, Steel joins Dr. Mid-Nite at a hospital set up specifically for meta-humans, and Alan Scott makes a military-like courtesy call to the wife of the missing Animal Man. I'm not sure we would have seen such camaraderie among the heroes just a few years ago. These kinds of touches reinforce the tone of the DCU post-Identity and Infinite Crisis, where the heroes live in a rich community of other heroes, and face danger not unlike policemen and fire fighters. Though the tone, overall, may be unrealistically cooperative and optimistic, it's a welcome change from the "grim and gritty" years. 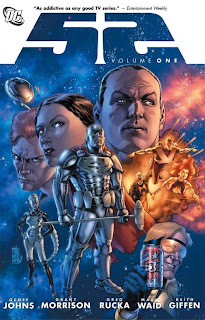 In removing Superman, Batman, and Wonder Woman, 52 also shows the rich tapestry of the new DCU Universe, from the inclusion of lessed-used characters like Zauriel, Whisper a'Daire, and Intergang, to the apparent Xavier/Magneto friendship between the Metal Men's Dr. Will Magnus and the villain T. O. Morrow. In lieu of the "History of the DC Universe" and other back-up features that originally ran with 52 the trade instead offers two page "Behind the Scenes" looks at each 52 chapter, usually commentary by one of the writers followed by a piece of script or an art breakdown. I enjoyed these very much and wouldn't mind seeing them in all trade paperbacks, though the stories here are richer because of 52's frenetic publishing pace. What was especially interesting were the mistakes that the authors point out (Batwoman's unintended debut, the wrong Gotham Central officer drawn in), and that--in this day and age of trade paperback revisionism, as writers and artists use trade paperback to correct their mistakes--have been left in the trade (along with others that the writers don't mention, like Ralph Dibney's amazing disappearing, reappearing beard). Not only does this allow the trade reader to experience some of the pitfalls of a weekly series just as the weekly readers did, but it gives the whole thing the feel of watching a live episode of your favorite TV show. 52 Vol. 1 is an imminently readable trade paperback, and certainly worthy of all the hype that surrounded it. "Addictive," as the series has been called, is an apt description; I'll be looking forward to the release of volume 2.